A sweeping historical debut about the Creole socialite who transformed herself into an empress. Readers are fascinated with the wives of famous men. 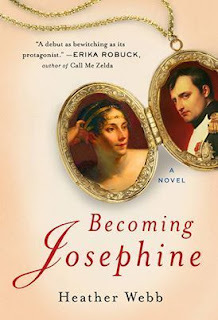 In Becoming Josephine, debut novelist Heather Webb follows Rose Tascher as she sails from her Martinique plantation to Paris, eager to enjoy an elegant life at the royal court. Once there, however, Rose’s aristocratic soldier-husband dashes her dreams by abandoning her amid the tumult of the French Revolution. After narrowly escaping death, Rose reinvents herself as Josephine, a beautiful socialite wooed by an awkward suitor—Napoleon Bonaparte. "France, armée, tête d'armée, Joséphine." These, the final words of Napoleon Bonaparte, are what first sparked my interest in Joséphine de Beauharnais. In exile and faced with his own mortality, the former Emperor of France might have had any number of things on his mind, but why, I wondered, was the woman he abandoned so prominent among them? Who was this woman to have captivated him so? Napoleon's reasoning will never be truly understood, but author Heather Webb has given readers the next best thing in Becoming Josephine. A fictional chronicle, the novel highlights Joséphine's fiery perseverance and generous spirit against the trials and tribulations that marked her life. I knew going into this piece that my opinion would hinge on Webb's characterization of her heroine and generally speaking, I think she hit the nail on the head. Webb paints a wonderfully compelling portrait of Napoleon's first Empress. In these pages, as in life, Joséphine is a complex, dynamic, and self-reliant woman whose bold independence knows no bounds. That being said, I found the scope of the novel something of a challenge. Spanning thirty years, the narrative's momentum wanes in several places, at times making it difficult remain engaged in the story. Don't misunderstand, I really appreciated Webb's interest in portraying Joséphine's story in its entirety and I completely understand how difficult it would be to compress the material, but I can't help feeling the extensive timetable was detrimental to the pacing. My real criticism relates to Joséphine's relationship with Alexandre as compared to her relationship with Napoleon. Despite the ultimate failure of their union, Joséphine's first marriage comes full circle, feeling complete within the confines of the narrative. Her second, on the other hand, lacks closure and I think that really undermined and distorted the significance of Joséphine's sacrificial acceptance of Napoleon's decision to divorce. Her final act represents a powerful moment in terms of who she was and what she believed, but I felt that emotionally, it paled in comparison to her reconciliation with Alexandre. Nitpicky? Yes, but that's me. A promising debut, Becoming Josephine delivers a fascinatingly vivid account of one of history's most captivating characters. Extensively researched and impeccably detailed, Webb's is a memorable story of political intrigue, steadfast persistence and passionate devotion. Hope budded in my chest. For the first time ever, I had no boundaries, no one to live up to or to persuade of my validity. My life and worth were my own. She did explain some of her exclusions in the author's note, but I appreciate your calling the span of the novel to my attention, because it was noted during the read I was just so moved by the end any criticism flew out the window. As always, I enjoyed your honest review.